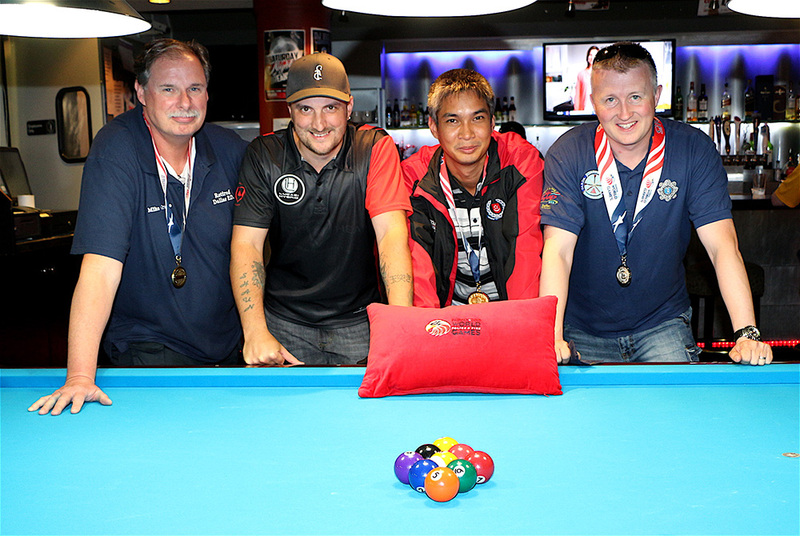 Day 2: (L-R) Michel Grosso (bronze-USA), Shaun Wilkie (Lucasi-sponsored pro, USA), Wesley Beins (gold-SGP), John O'Sullivan (silver-IRL). Photo courtesy of Bob Lerch. FAIRFAX — Day 2 of the Pocket Billiards competition from the World Police and Fire Games has been completed. The final 8 competitors squared off in races to seven with medals on the line. In the end, it was gold for Wesley Beins (Singapore), silver for John O’Sullivan (Ireland), and bronze for Michael Gross (USA). In the round of 8, the results were Wesley Beins (Singapore) def. Jordan Greenhaw (USA), 7-5. Mike Grosso (USA) def. Doug Moreau (Canada), 7-5. Eric Cloutier (Canada) def. Joe Rodrguez (USA), 7-5. John O'Sullivan (Ireland) def. Genadijs Kaminskis (Latvia), 7-6. Greenlaw, Moreau, Rodriguez, and Kaminiskis were eliminated from medal contention. In the final four, it was Wesley Beins (Singapore) def. Mike Grosso (USA), 7-3. John O'Sullivan (Ireland) def. Eric Cloutier (Canada), 7-6. Beins and O’Sullivan headed to the gold-silver match, while Grosso and Cloutier landed in the bronze-4th place contest. In the finals, O’Sullivan bolted to a quick 3-1 lead. As Beins hit stroke, The Irishman grinded to a slim 5-4 advantage. It would prove to be short-lived, as the steady Singaporean took three racks in a row to claim gold, 7-5. “I’m happy with my performance today,” shared Beins, in understated form. In the bronze medal match, Grosso surprised himself in pulling out a tough decision, 7-5. “I worked very hard to beat a strong player, and I did not see this coming,” admitted the American. Cloutier, was noticeably disappointed. After being the second to qualify for the final 8 on Day 1, he had lost two matches in a row to finish the 9Ball competition. “I didn’t play my best today, though I was able to get within five balls of playing for the gold,” recounted the French Canadian. Beins (SGP), gold, 6-0 W/L, won 36 of 55 racks, .636 WPCT. O’Sullivan (IRL), silver, 5-2 W/L, won 36 of 70 racks, .514 WPCT, losses: Cloutier (3-5), Beins (5-7). Grosso (USA), bronze, 6-2 W/L, won 367 of 65 racks, .569 WPCT, losses: Garcia (4-5), Beins (3-7). Lucasi-sponsored pro Shaun Wilikie was on hand for five hours in the afternoon to warmup and chat with eliminated players before Wednesday’s straight pool brackets. While the change in format will be dramatic, we expect more of the same great play that we saw for two days in the 9 Ball event. B.C.A Update From "Big Red"